This is my last evening in Hanover. 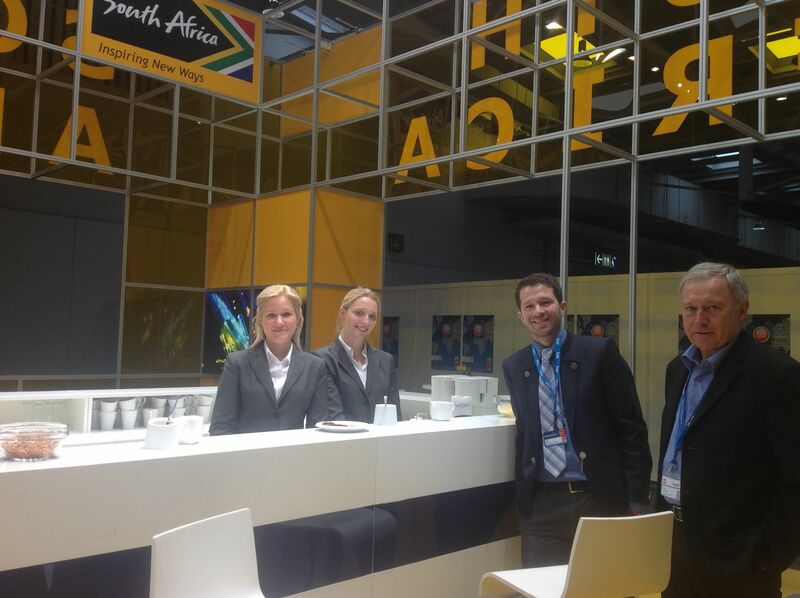 As we enter the final day at CeBIT 2013, its time to reflect on the show and the success – or otherwise – of the SA National Pavilion. It first must be said, loudly and clearly, that the dti and their team – Marc Müller, Gordon Gleimius, Mpati Mphela and Karin Liebenberg – did us proud. The unanimous opinion from both exhibitors and visitors is that the South African National Pavilion was magnificent. We could not have asked for anything better and all of us (including SA visitors to the pavilion like Dean Yon) felt extremely proud to be South Africans. Some of the exhibitors on the Pavilion generated a great deal of interest and even signed some deals. For example, the holographic display from “Bottomline Interactive” and “Customer Care Solution” stood out as one of the highlights of the entire CeBIT show. Wiscor Technologies signed an MoU with the Russian Ministry of Education around their “traveling classroom” software. Without exception the companies on the SA Pavilion were pleased they had come to CeBIT, believed they have benefited and would aim to come again. Exhibitors on our Pavilion said that coming to CeBIT had allowed them to see what other similar companies around the world were doing. It allowed them to see their products and service offerings within a broader international context. They also made contacts that could lead to future business benefits. Without doubt CeBIT is a great show to come to. It may take place in Germany, but it is truly international and multi-faceted. Anything and everything that falls under the banner “ICT” from everywhere in the world will be found at CeBIT. Similarly visitors are not only German, or European. Based on visitors to our Pavilion I conclude that the only continent that is under-represented at CeBIT is Africa. Against this background of success and happiness I do, however, have some negative thoughts. While all who participated in the National Pavilion benefited, did we bring the right companies? Also, did the companies that came benefit as much as they could have? My answer to both of these questions is “No”. Not all of the companies on the Pavilion are “export ready”. When a company comes to CeBIT it should ideally have something that is tried, tested and ready to sell. It should be a company that has a strategy with some clear focus on international partnerships and markets. Before coming to CeBIT companies should do a great deal of preparation – book meetings, make lists of competitors and potential partners, print suitable leaflets, prepare websites, etc. The dti has come to the party. It has invested a great deal of money and provided extremely generous incentives. I believe, however, that the SA ICT industry – individual companies, associations, and others – can and must do a whole lot more to achieve significant results from our participation at CeBIT. We need to work harder to find the right companies and prepare them for coming to CeBIT. I often hear SA ICT companies complaining about Government’s lack of support for the sector. In CeBIT we have a clear example of significant Government support, and yet we struggle to find companies willing and ready to participate. With this in mind we must roll up our sleeves and start working now to ensure that CeBIT 2014 is an even bigger success for South Africa. If you represent a company that could benefit from attending CeBIT, contact me at the JCSE, Eileen at the South African Electrotechnical Export Council (SAEEC), CITI/Silicon Cape, SmartExchange or the dti.